Emergency drills are an important exercise for health care organizations to optimize skills and gain familiarity with their health care partners. Smoothly incorporating everyone’s role in an emergency situation is a key factor for success. This is one of the many reasons Ocean Reef Public Safety and the Medical Center at Ocean Reef practice emergency drills like the one jointly performed Aug. 13. Held at the Medical Center, the recent drill was staged for emergency personnel to respond to back-to-back critical patients, one of whom was an infant. This heightens the passions of all medical personnel. Nurses and physicians sprang into action as the first patient arrived. (See photo at right.) Once the initial diagnosis was confirmed, they immediately called 911 for Medical Rescue to respond. The drill observers noted that the ambulance was on scene in an amazing 1 minute and 22 seconds. As the first patient was being cared for, the drill leaders announced that the second patient had arrived, causing staff to make quick adjustments and call for additional medical responders. Paramedics, nurses and physicians all worked proficiently in textbook manner, performing their individual roles smoothly to provide the best possible care to both patients. After appropriate determination, the paramedics called for a medical helicopter to fly the patients to a trauma care center. 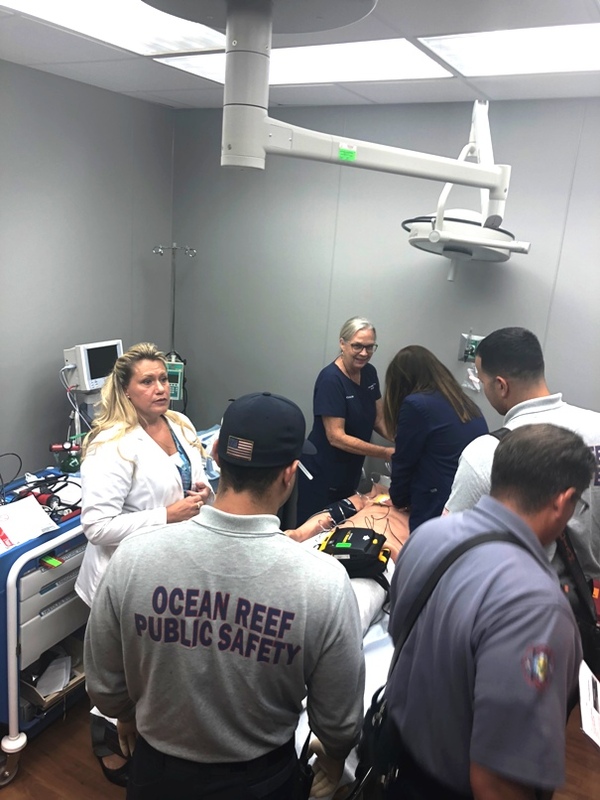 Like previous drills, the August exercise was a huge success, illustrating the proficiency of the marvelous healthcare providers of Ocean Reef.